"It was like lamenting over thirst while the solace of water was close at hand. But I'd remained empty and instead of taking a long drink of healing and offering forgiveness, I'd poured the water onto the earth to satisfy the bitter roots I harvested daily. Could water even satisfy my thirst anymore?" 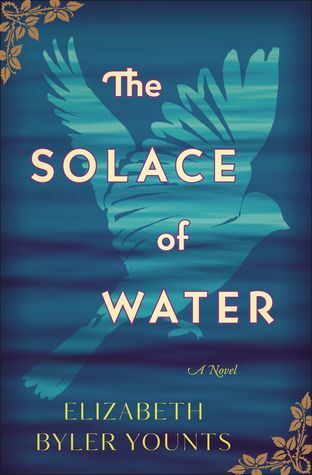 The Solace of Water broke my heart on every page but then ended up with a wonderful uplifting message that totally erased all of my sadness. The main characters are wonderfully written and so real that the reader can feel their pain and heartbreak over the sorrow that they both live with. The time is the early 1950s and the place is a small town in Pennsylvania. Delilah Evans, her husband and children move from Montgomery, AL to Stinking Creek PA where her husband grew up so that he can pastor a church there. Delilah (DeeDee) is still struggling with the loss of one of her children and is unable to handle life due to the loss. She blames her oldest daughter for her son's death and is unable to mother her as she should be doing. The Evans family share woods with an Amish family who also have problems. Emma feels cut off from the Amish community due to problems with her husband and son. As unlikely as it seems. Emma and DeeDee become friends despite their differences. As their secrets come to light, will they be able to maintain a friendship despite their differences? This is a powerful well-written novel about family and friendships, love and forgiveness not only of others but also of yourself.